My long run was pretty short today (five miles). I am running a 5k tonight, so I will get a total of eight miles in today. There were only four of us running this morning. 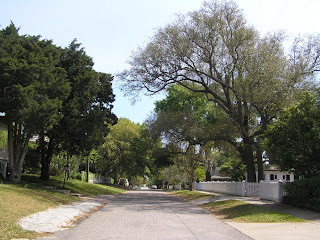 The weather was great and I loved the route we used through the Old Village and down Coleman Blvd. The first mile we ran at a really slow pace (11:00 +). We picked it up for the next four miles and averaged 10:00 +. I was really trying to hold back and run at a slow pace so I would not be wiped out for the race tonight. I was also working on my form. I was able to get my arms from swinging in front of me. I was also working on the placement of my feet. I noticed that when I worked on leaning forward I landed on my mid foot and not on the back of my heel. Although I usually like to push it and run at a faster pace, it was nice to be able to run and talk with another runner for a while. This was a really relaxing route and pace.